Sochi, 2014. What a strange Winter Olympics! I was glad when the events got underway so the journalists would have something to do other than whine about how bad the hotels were. It all worked out wonderfully from what we could see. Well, if Shaun White hadn’t cut his hair it might have come out a little better for the USA. The weather was agreeably warm for enjoying the beach most of the days we were there, but about the fourth day an afternoon thunderstorm stirred up the sea so that the deep cold water was brought to shore. The water was too cold for all but the hardiest for the rest of the week. With the water affected as it had been, the temperature varied sharply from one spot to another. Little streams of cold and warm water swirled around silently in the shallows. If you moved a few meters one way or the other it would change from warm to frigid and back again. [My friend and fellow volunteer] Justin said he had read that at the lower levels of the Black Sea there was cold fresh water, from its ancient origins as a lake fed by the Danube and the other rivers going into it. Riding above this cold layer was the salty seawater from the Aegean (or in Bulgarian, “The White Sea”) across the Dardanelles where treacherous currents form at the boundary of the two large seas. Since salt water was heavier than fresh water, it was a bit of a mystery why it was this way instead of the other. It was as if the seawater were balanced precariously atop the lighter fresh water, and had been for a long time, since the channel between the two seas opened up. Some scientists saw a danger in this seemingly unstable situation, that something could cause the two water masses to flip over, destroying the ecology of whatever lived in either zone. As I moved from one stringy stream of cold water to another I wondered what intricate balances there might be, that we were completely unaware of, in things we see and experience every day. Lately we read of trouble in Ukraine. I think of instability and balance. Halfway between Balchik on the west shore and Sochi on the east, the Ukrainian city of Sevastopol has installed a pro-Russian mayor, staking claim to the strategically important Crimean peninsula. It sits between the pro-European demonstrators in Kiev to the west, with its ruins and bloody confrontations and smoldering fires, and the Russian-leaning eastern half of Ukraine. In the east, the ousted president is hiding out from criminal charges pressed by those in the western half, taking refuge with the Russian majority. Mr. Putin, coming off his successful run as scowling emcee of the Sochi Olympics, wields a bludgeon comprising, of all things, economic threats. 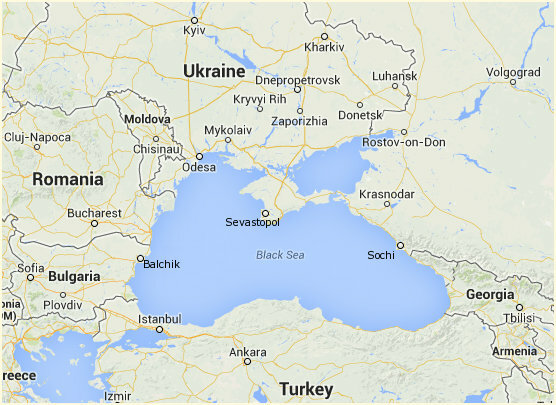 The map (click to embiggen) shows Sevastopol on the big peninsula resting in that unstable Black Sea, balancing Ukraine above it precariously on a point. It looks like a seesaw, a child’s teeter-totter. The Black Sea, where that fulcrum rests, has Bulgaria and Romania on the west shore, both members of the EU albeit in a marginalized status with limitations and contentious conditions. On the east shore, Russia and its other little problem, Georgia. In between, literally and figuratively, geographically and philosophically, Ukraine. I hope the idea that the Black Sea is potentially unstable is a baseless worry, and that nothing will ever cause the two water masses to flip over and destroy the ecology of the sea. And I hope the dangerous instability in Ukraine will resolve itself without damaging either side. If one kid falls off a seesaw, the other one gets hurt too. This entry was posted in About the area, Peace Corps and tagged crimea, east and west, instability, politics by Bruce McDonald. Bookmark the permalink. Developments in Ukraine are as changeable this week as the currents you describe in the Black Sea. I hope there is more balance than instability in the coming weeks on see-saws, the Black Sea, and Ukraine. Changeable, wow, you’re so right! When I wrote this article it was a days before those uniformed but unmarked troops moved in with their presumed Russian affiliation and quietly started their blockade, or positioning, or threat of attack, or whatever it is. Things moved fast and big for a few days, then positions stiffened, and now we see small feints and jittery moves. It’s like watching a game of Tetris, or the breakup of ice in a river. From the west, hollow and impotent threats. From Kiev, what, nothing? Oh, of course. . . it’s not really a government, is it? Not yet anyway. It seemed to be in the process of becoming one when all that was interrupted. I won’t continually try to mirror all the news and editorials here as this situation develops (after all, I was just making an observation about instability) but here’s another view. I have not watched the Sochi Olympics this time, but Polish team came back home with a few gold medals :-).